iv - the real or money value of total assets. Cost is the price of a factor of production used in producing final output. Cost, together with the final price and quantity of output, is a key factor in economic decision-making. Thus profit equals price per unit multiplied by the quantity of output (or revenue) minus the total cost of all factors of production. Diversification refers to the distribution of productive investment across additional geographic markets, or multiplying the number and types of outputs in order to insure profit stability by offsetting gains and losses. In intermediate theory, geographic diversification is not formally considered except as a factor cost. Similarly, multiple outputs are not formally considered. ii) economic efficiency is achieved when the cost of production of given level of output is as low as possible. The key difference is cost. Thus while all economically efficient solutions are technically efficient, technically efficient solutions may not be economically efficient, that is, something may be technically possible but uneconomic. The word originally comes from the French entre meaning 'between' and prendre meaning 'to take'. The English word 'middleman' catches this original meaning. Thus European traders (especially from Venice and Genoa) during the Middle Ages and Renaissance 'middled', at high risk, between foreign suppliers, e.g. of silk and spices, and final consumers in Europe. Today the term usually refers to someone who sees and seizes an economic opportunity or a market opening. This may take the form of a new product or of servicing an existing market in a new way. In both cases a high degree of creativity and risk-taking is implicit in the word. In intermediate economics it is assumed an entrepreneur is the owner of a business. The entrepreneur is rewarded through the payment of profits, i.e. the difference between revenue and the cost of all other factors of production. A firm is a technical unit engaged in the production of one or a group of related commodities. In intermediate theory, a firm is assumed to produce only one product with the entrepreneur serving as a surrogate for the complex decision-making or managerial hierarchy of a modern corporation. Study of the firm focuses mainly on external behavior (sales to consumers) and internally on cost of production. A factor of production or input is any good or service that contributes to the production of output. In intermediate theory, factors include: capital (K); labor (L); land (N); and, entrepreneurship (E). This last factor is poorly defined and resists empirical measurement. In intermediate theory labour includes all workers employed by a firm and who only receive a salary (from the French sel or salt) or wages, i.e. income, in return for the disutility of their work. Labour is assumed to be unorganized, i.e. no unions, and atomistic, i.e. infinitely divisible. Land, in intermediate economics, stands as a surrogate for all raw materials or natural resources. Land is rewarded through the payment of 'rent'. Land is assumed to be atomistic, i.e. infinitely divisible. Output is the result of transforming inputs into goods or services that satisfy, directly or indirectly, human wants, needs and desires. In intermediate theory, the quantity of output, along with price per unit and the cost of factors of production is key in the economic equation. Output is increased until any additional output reduces profits. How to satisfy wants, needs and desires, or how to use factors of production to produce output, subject to scarce resources, requires a choice among alternatives possible uses. The choice of the best alternative, however, implies that the next best alternative is not chosen. Put another way, the cost of choosing one alternative possibility is the next best alternative foregone. This is called 'opportunity cost'. All economic costs are opportunity costs and this distinguishes economic from accounting or business costs. Thus normal profit in economics is the opportunity cost to the entrepreneur in his or her next best alternative employment, e.g. working as an employee for another firm. a firm may be owned and controlled by the same individual or group, or these two functions may be separated. If there is a separation of ownership and control the principal-agent problem can arise. Thus if a firm is owned by a large number of shareholders while it is operated by a distinct management then the objectives of these two group may conflict. For shareholders (the principal) it is assumed the objective of the firm is maximizing share value and profits to be distributed as dividends. For management (the agent of the principal) or what John Kenneth Galbraith has called the technostructure the objective of the firm conflict with the objectives of their principal. Thus management may strive to maximize salaries and 'perks', e.g. corporate jets, oak-lined offices, etc (see J.K. Galbraith, The New Industrial State, Signet, New York, 1968). Advanced microeconomic theory recognizes what is called 'satisificing behaviour' as common among management or widely-held firms. Thus management, rather than maximizing share value and profits, tries to satisfy shareholder, workers and customers while maximizing its own self-interest. In intermediate theory, it is assumed there is no significant effect of the separation of ownership and control and therefore profit maximization remains the functional objective of the firm. Production involves the creation of goods and/or services, which, directly or indirectly, satisfy human needs. Through production the firm generates supply which is the obverse of consumer demand. In intermediate theory, production is viewed as the only function of the firm. Through supplying commodities demanded by consumers, the firm maximizes profits. ii - economic or excess profits that is profits in excess of the opportunity cost of the entrepreneur. A rational entrepreneur tries to maximize profits, i.e. generate the largest possible difference between revenue and the cost of factors of production (by definition, excepting entrepreneurship). This can be achieved by minimizing cost or raising prices. In intermediate theory, profits are expressed in dollars and it is assumed that no other objective, e.g. satisficing behaviour, is compatible with rationality. iii - the Long-Run refers to the timeframe in which all factors of production are variable and, accordingly the size of plant and equipment or the scale of production can be varied. It is important to note that in economics the short- and long-run are not measured by calendar time, e.g. a day, week, month, year or decade, but rather by whatever calendar time it may take to vary a given factor of production. In the case of a small business, for example, the long-run for capital plant and equipment may be an hour, a day or a week before a new piece of equipment can be added. In the case of a nuclear power plant, the long-run may be ten years or more. Technology refers to the ways and means by which factors of production are combined to produce output. The word technology is derived from the Greek tekhne meaning Art and logos meaning Reason, i.e. reasoned art. Since the Neo-Classical Period of economic thought, when technological change was first introduced as a factor of production, the concept has evolved. At that time, technological change was considered "disembodied" or systemic, e.g. general improvements in communications and transportation. After the Second World War, during the so-called Keynsian period, the concept changed to "embodied" technological change, i.e. specific bits of scientific knowledge embodied in specific products such as the transistor in the transistor radio (see Evolution of the Knowledge-Based Economy). In the post-Keynesian or postmodern period of economics, the concept has changed again to embrace what can be called 'epistemologic' or knowledge-based technological change. Thus the Natural & Engineering Sciences generate physical technology, that is, how to manipulate the natural world. The Humanities & Social Sciences (including management) generates organization technology, that is, how to manipulate the human-made world. The Arts generate aesthetic (from the ancient Greek meaning to gasp) or design technology, that is, how to manipulate the human heart and soul to achieve what the Greeks meant by kosmos, that is, the sense of the right ordering of the multiple parts of the world. Different countries and cultures appear to have an advantage with respect to these different forms of technology, e.g. 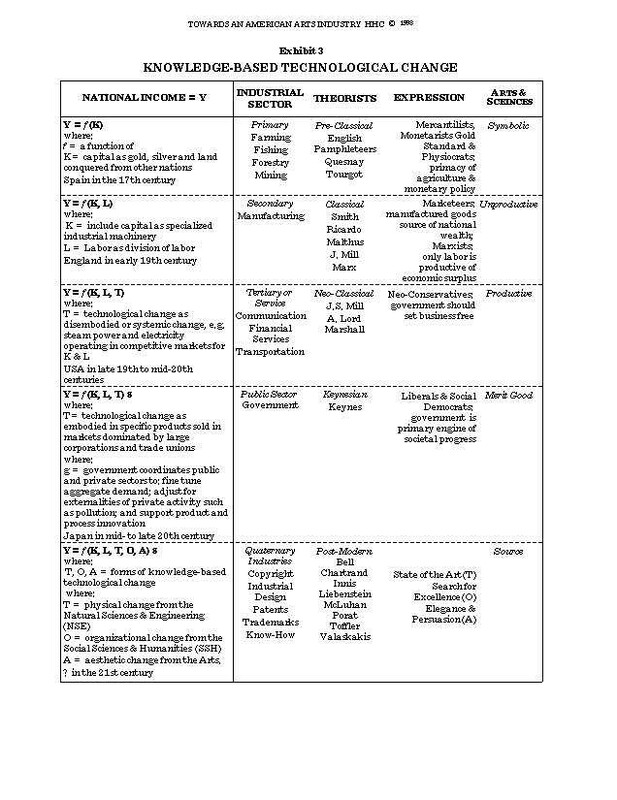 the USA with respect to physical technology resulting from R&D, Japan with respect to organizational technology and Italy with respect to design technology. These different forms of technology can and should work together. Transaction costs involve costs associated with bringing buyers and sellers together. In many cases a firm can produce necessary inputs internally or it can buy them on the market from other firms. Transaction costs involve finding out which firms produce the necessary inputs, negotiating and contracting with them for their delivery, and the costs of enforcing the resulting contracts, e.g. insurance and/or legal costs. Depending on the size of transaction costs a firm will choose to internalize production or buy on the market. a) Consumer purchases commodities to obtain satisfaction, i.e. utility. The firm purchases inputs to produce outputs. b) The consumer has a ‘utility function’. The firm has a ‘production function’. c) The consumer’s budget line or equation is a linear function of the amount of commodities purchased. The firm’s cost function or equation is a linear function of the amounts of inputs purchased. d) Rationality implies the consumer maximizes utility. Rationality implies the firm maximizes profits. a) The utility function is subjective and ordinal with no unambiguous cardinal measure. The production function is objective and output can be measured in cardinal terms. b) The consumer maximizes utility subject to an income constraint. The firm maximizes profits subject to a cost constraint but costs are variable.